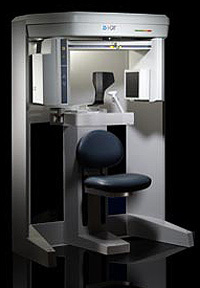 At our practice, we utilize the award-winning i-CAT® Cone Beam Scanner for our 3D dental imaging. This system completely integrates with the office software. As a result, your patient records information is completely integrated, allowing your treatment plan to be determined with greater accuracy. Consistently high quality, high resolution scanning is complete in under 5 seconds. Our cone beam scanner provides surgical predictability with treatment planning in full 3D. The high resolution, volumetric images provide completely 3-dimensional views for more thorough analysis of bone structure and tooth orientation. Precise data and measurements are obtained, allowing the surgeons to calculate perfect positioning. The entire course of treatment can be mapped, from surgical placement of the implant and abutment, all the way to final restoration.